Hey friend! Today, I am teaming up with some blogging buddies to bring you all kinds of Christmas inspiration through this little Holiday Blog Hop. If you are joining me from Cambridge Home Company, welcome! So glad you are here!! Be sure to check out all the other blogs on this Holiday Blog Hop for major Christmas eye candy. I've listed them all below! Because we got a new tree for the family room this year (I blogged all about my new King of Christmas flocked tree HERE, I thought I would put our old tree in the bedroom. I've never had a tree in the bedroom before, and it is so fun! It feels so indulgent and luxurious! I love having the soft warm glow of the Christmas tree lights on in the evening as I'm laying in bed. In addition to the tree, I just added subtle hints of Christmas in this room, using small trees, greenery, and a Christmas pillow. We also hung new drop cloth curtains--which I've been meaning to do forever. (And yes, I know they are backwards--more on reasons why later!) The curtains definitely make the space feel more finished. We are planning to add some architectural interest to this room in 2018 via shiplap or board and batten. I just have to decide which one. I took an Instagram poll, and it literally came out 50-50. Anyway, once the shiplap/board and batten is done, the room will definitely feel more finished. But, I'm loving the way it's slowing coming together, and I'm really loving the subtle hints of Christmas in here now. If you follow me on Instagram, you've probably only ever seen one side of this room. So come on in and let me give you the full tour! This is the view as soon as you enter the bedroom. The dresser is usually in that corner, but I moved it out of the way to make room for Christmas cheer! The gold side table is from At Home Stores; the chair and pillow are both Home Goods. The mercury glass Christmas trees were a gift from my mother-in-law years ago. The ceilings in this room are about 10 feet at the highest point. We just hung the drop cloth curtains from the highest point of the arched window and it really makes the room feel so tall and so spacious. I picked up that faux flocked wreath for only $10 if you can believe it! I LOVE the Christmas vibe it gives this room, and I pretty much want to leave it up all year long. As you make you way around the room, you encounter the hubs' night stand. I dressed it up with little white houses I picked up from Target this year. How cute are they? They are open in the back so you can put a tea light in them. Adorbs. My kiddo keeps putting tiny bottle brush trees in there. 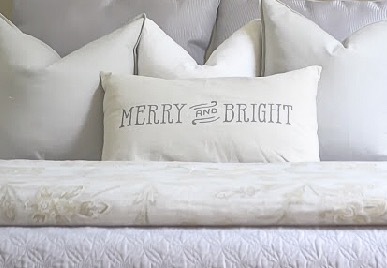 The Merry and Bright pillow is from one of my favorite Etsy shops. For all the shopping details, head over to my SHOP page! This room gets plenty of sun, but the large window on the far wall (and the days upon days of dark, gloomy, rainy weather) made it so difficult to get a decent picture of this space! So please forgive all the grainy photography! I just put some subtle touches of Christmas in this room with the flocked garland around the bed, a single Christmas pillow on the bed, and trees and stockings on the nightstand. It's subtle and Christmasy, without being too overwhelming. These mirrored nightstands have long been one of my favorite furniture purchases! When I was deciding between these and another (less pricey), the hubs suggested I splurge and go with what I liked best. Boy, how right was he?! I got these at Kirklands years ago, but I've seen the exact same ones at Ashley Furniture. I used a simple gray satin ribbon to dress up the stocking I hung from the nightstand drawer. The rug is a find from At Home Stores and is incredibly affordable. They still sell it, too, the last time I checked! I hope you have enjoyed this Christmas Bedroom Tour. Be sure to head over to Megan at Texas Sized Home for her holiday inspiration next! And don't forget to check out all the other spaces in this blog hop! !